The German Shepherd Dog is one of America’s most popular dog breeds - for good reason. He’s an intelligent and capable working dog. His devotion and courage are unmatched. And he’s amazingly versatile, excelling at most anything he’s trained to do: guide and assistance work for the handicapped, police and military service, herding, search and rescue, drug detection, competitive obedience and, last but not least, faithful companion. The German Shepherd Dog may embody some of the best traits of dogs, but he's not for everyone. This is a slowly maturing breed with a long puppyhood. This breed has a distinct personality marked by a direct and fearless expression and self-confidence. The GSD personality is often aloof, but not usually aggressive. He's a cautious and intuitive dog, and may not make friends immediately, but once he does, he's extremely loyal. With his family he's easy-going and approachable, but when threatened he can be strong and protective, making him an excellent watchdog. This highly intelligent and trainable breed thrives on having a job to do - any job. The German Shepherd Dog can be trained to do almost anything, from alerting a deaf person to a doorbell ring to sniffing out an avalanche victim. One thing he's not good at is being alone for long periods of time. Without the companionship he needs - as well as exercise and the chance to put his intelligence to work - he will become bored and frustrated. The German Shepherd is an extremely high energy dog, therefore one who's under-exercised and ignored by his family is likely to express his pent-up energy in ways you don't like, such as barking and chewing. 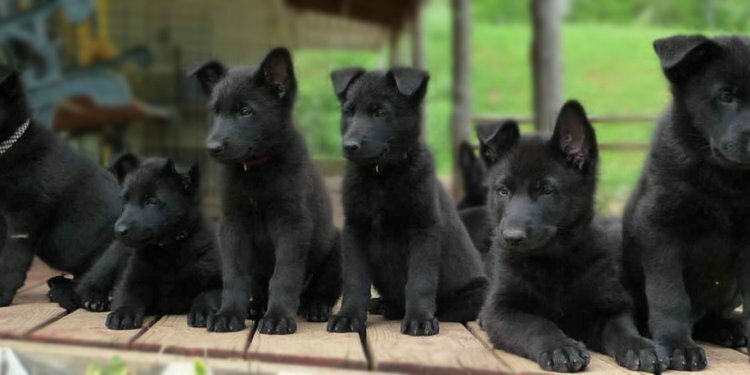 Like every dog, the German Shepherd needs early socialization - exposure to many different people, sights, sounds, and experiences - when they're young. Socialization helps ensure that your German Shepherd puppy grows up to be a well-rounded dog. Surprisingly, the German Shepherd Dog has been in existence as a distinct breed for only about 90 years. The breed traces its ancestors to a widely diverse group of sheepherding and farm dogs in Germany. In the late 19th Century, informal breeding groups of sheepherders banded together through a common interest in their dogs and attempted to produce dogs with the desired working attributes. The initial group disbanded, but another society formed in 1899 flourished. This group, Der Verein fur Deutsche Schaeferhunde (sv) was founded by Max von Stephanitz, a cavalry officer known as the father of the breed. The first GSD was shown in America in 1907, and the breed was recognized by the AKC in 1908. Popularity of the breed rose dramatically after World War I, when returning soldiers told of the heroic dogs' work with the Red Cross, at the front, for the police, and on guard duty. In addition, Rin Tin Tin and Strongheart, two beloved silent film stars, captured the hearts of the American public. Today, the German Shepherd Dog is distinguished for his loyalty, courage, and ability to retain training for a number of special services. Members of the breed are widely used by police officers and the military, as guide dogs for the blind, guardians, drug and contraband detection dogs, and Search and Rescue dogs. Most, however, are purchased to serve the important role of devoted family friend and protector. If he's well trained and has had plenty of exposure to kids, especially as a puppy, a German Shepherd Dog is a great companion for children. In fact, some say he's a cross between a babysitter and a cop, both gentle with, and protective of, the children in his family. This is a big dog, though, capable of mistakenly bumping a toddler or small child. True to his reserved nature, he's not always tail-wagging friendly with kids he doesn't know. The German Shepherd Dog can live peacefully with other dogs and pets, as long as he was taught to do so from puppyhood. Introducing an adult German Shepherd to a household with other pets can be more difficult if the dog isn't used to getting along with other dogs or cats. You may need to hire a professional trainer to help, or get advice from the rescue organization if that's where you acquired the adult German Shepherd. On the physical side, the German Shepherd Dog is of medium to large size, with enough weight to be effective as a herder or a patrolman, but not so big as to be cumbersome. This is a trotting dog that can cover a lot of ground very gracefully, with almost no effort. The GSD generally weighs 75-95 pounds, with males usually larger than females. Popularity of the breed has led to a great deal of diversity. Colors can be black and tan, black and red, black and cream, black and silver, solid black, sable, and white. Their double coats come in a variety of lengths from short to long. Sometimes jokingly called "German shedders, " the breed sheds year-round, and generally "blows" ( sheds a lot of hair at once, like a snowstorm) twice a year. If you want a German Shepherd, be prepared for hair on your black pants, on your white couch, and pretty much all over the house. There's no magic solution to shedding. Accept it. However, brushing two to three times a week will help more of the hair come out in a brush, rather than on your furnishings. And a sturdy vacuum cleaner doesn't hurt either. Bathing the dog too often strips the coat of oils that keep it healthy, so start running the bathwater only if your dog really needs it.